One of the seventeen children of James Herbert, a waterman, and Emma Jemima née Aldridge, David George Herbert, known as George, was born on 27 July 1894 at Lea Court farm, Framilode. As the family grew, and James became a master mariner and owner of boats, he had Kimberley House built near Fretherne Bridge to house his extensive family. Frampton's school records indicate that the Herbert children were often late; on 16 July 1909, for instance, they arrived at 9.20am and were sent home. After Emma's death, James wrote on his 1911 census form that he was unable to be away on his boats; his daughter Lily was housekeeper while George was working his trow, Reliance. James later sold his house and its grounds to Cadbury's and it became their factory manager's home. In George's own words to his family, 'after a drunken night out' he enlisted in the 10th (Prince of Wales's Own Royal) Hussars on 27 September 1914. However, he was set on getting out so that he could join the Navy, so while on sentry duty he would fire his rifle at cabbages in the fields and then call out the guard to pick up the 'bodies'! Eventually the Hussars gave way; on 28 December the same year he was discharged for misconduct on condition that he then joined the Royal Navy. These were most unusual circumstances. A year later, George enlisted as a stoker in the Royal Navy, his date of birth being recorded as 27 July 1896, exactly two years after the actual date. This proved to be a more successful contribution to the war effort; after three months at the Navy's training establishment at Devonport, HMS Vivid, George was transferred to HMS Gloucester. When George arrived on board on 15 March 1916 she was based at Scapa Flow; he was to stay with her until the end of his service. During the Easter Rising in Ireland she landed marines in Galway Bay and on 31 May-1 June 1916 she saw action in the Battle of Jutland. From December that year Gloucester was transferred to the 8th Light Cruiser Squadron in the Adriatic, and later served off East Africa. George was awarded the British War Medal and Victory Medal, but his service is not commemorated on the plaque in the village hall. 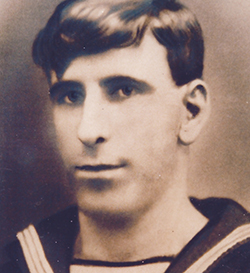 After his discharge from the Navy on 17 May 1919, George resumed work on his father's boats from which he used to wave to a servant girl at Saul Lodge. This was Ivy Henrietta Willis whom he married at St Mary's on 25 September 1922. They rented a small cottage at Church End, Frampton, next to the churchyard. The Depression hit the canal trade hard making life very difficult for George and Ivy as their seven children arrived: Archibald George, Walter James, Lilian Ivy, Frederick William, Nancy Margaret, Eric and Rosemary Ann. Their eldest son later noted, in a book recording the family's history, that his father was a hard worker and a strict disciplinarian, but also liked his alcohol, and was best avoided when drunk! In 1937 they were allocated a council house at 10 Whitminster Lane. David George Herbert was buried in St Mary's churchyard on 14 September 1974 after suffering gangrene poisoning following a stroke.